The reduced targets provided here are designed to be used at 100 yards. We have taken the official NRA-approved 1,000 yard target dimensions, and then reduced them as accurately as possible, to give you the correct visual appearance of the target when placed at 100 yards. The targets for 800 and 900 yards are larger than the 1,000 yard target because, in a match situation, the same target that is used at 1,000 yards will be the same target used at 800 and 900 yards. However, because you will be 100 or 200 yards closer to the target, it will appear slightly larger to you at those distances. Find the appropriate version for your computer system and then download the file and install it on your computer. Acrobat Reader is free of charge. 1) Check to make sure that the PDF file that we have provided has printed out in the correct dimension. We have provided the measurement for the black bullseye on each target so that you will have a reference against which to measure. 2) The purpose of providing these targets is to enable you to get used to seeing the target as it will appear at 800, 900, and 1,000 yards before you go to your first, or next, Long Range match. 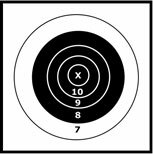 We have provided the targets in a 100 yard format because virtually everyone has access to a 100 yard range at their local gun club or rifle range. 3) Experiment with different-size front sight inserts and rear sight aperture openings to determine what makes the target look best to you. Generally, at 1,000 yards, most shooters are using either their smallest or next-to-smallest front sight insert. The insert that you choose to use will depend upon your eyesight as well as the lighting and visibility conditions on the day of your match. 4) Using these reduced targets will also help you to improve your holding technique. When you are aiming at a very small target, it is important that you hold the rifle exactly the same way, with the same sight picture of the target, every time you fire. Any variation from shot to shot will immediately become apparent on these reduced targets. As you practice more and more with these targets, you will become acutely aware of this fact and hopefully develop the skills that you need to deliver precise shots at these extended distances.